Dennis's tiny studio is coming along nicely. He's finished the shake shingle siding and now is working to complete the interior. So last week I showed you the rusty cart which is part of my backyard garden project. Now, I like old things. I really do. However, I'm not a big fan of totally rusty industrial pieces like this. (Heresy, I know.) I'd like it better if it still had at least a little paint on it. Or maybe a lot. And for this backyard garden project I'd like paint in an unexpected color. Something vibrant. Something cheerful. Something let's say. . .purple. Now stay with me. Soon you'll get the whole picture. Let's start with the reason for my project. This is the garden shed/greenhouse on the west side of our backyard before I started my project. 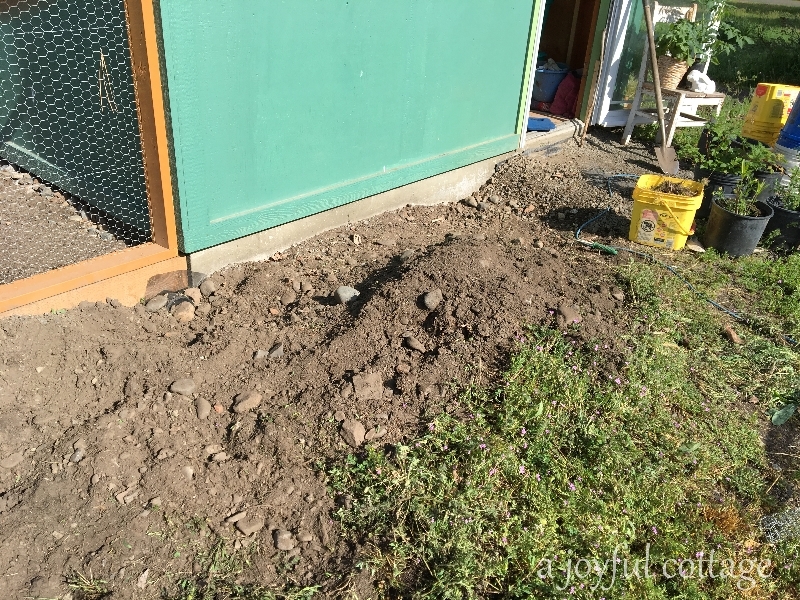 It was (and still is) mostly weeds, hard clay soil, and loaded with rocks. And -- let's 'fess up -- it was also a junk magnet. 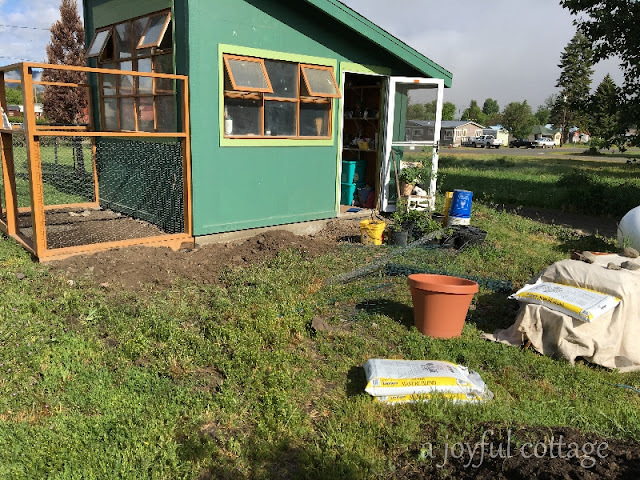 This is on the opposite side of the yard from the tiny studio, and our plan is to create a private, fenced in garden and patio that will join the garden shed and the new tiny studio. It'll be a major project that's not going to happen for a while, and in the meantime I wanted to do something quick, relatively easy and inexpensive to pretty up this space outside my garden shed. The first thing I did was level the ground. You can see in the above photo there were a lot of rocks. Rocks are something that we have plenty of, and we recycle them into decorative landscape elements wherever we can. 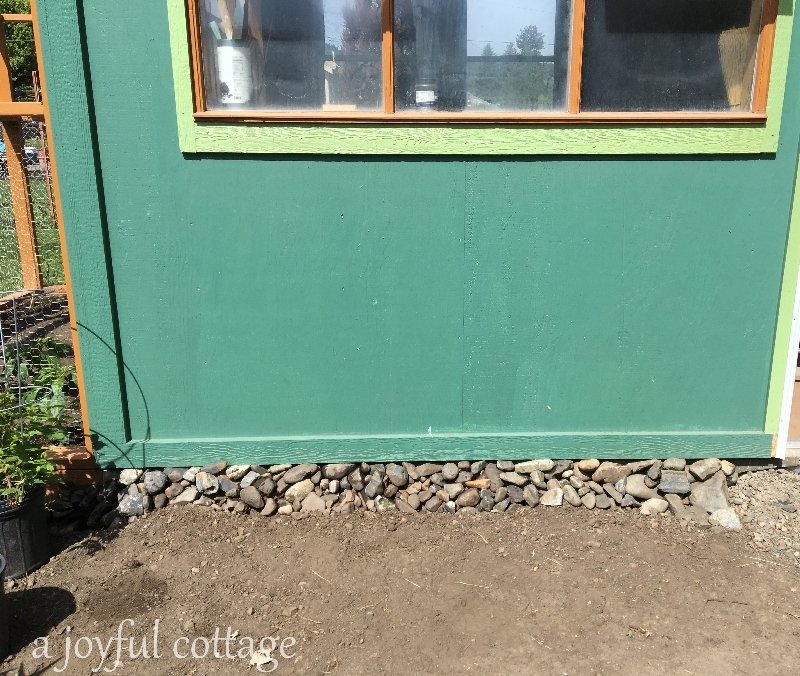 Here I used what I pulled from the leveling along with some other rocks we had stockpiled and stacked them around the garden shed's foundation. Added my purpleized cart with some flowers. 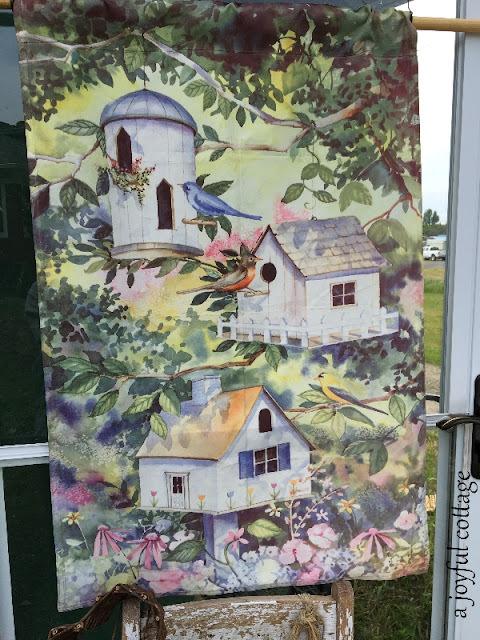 I shopped my garden shed for more garden decor. Put it all together, and voilà! 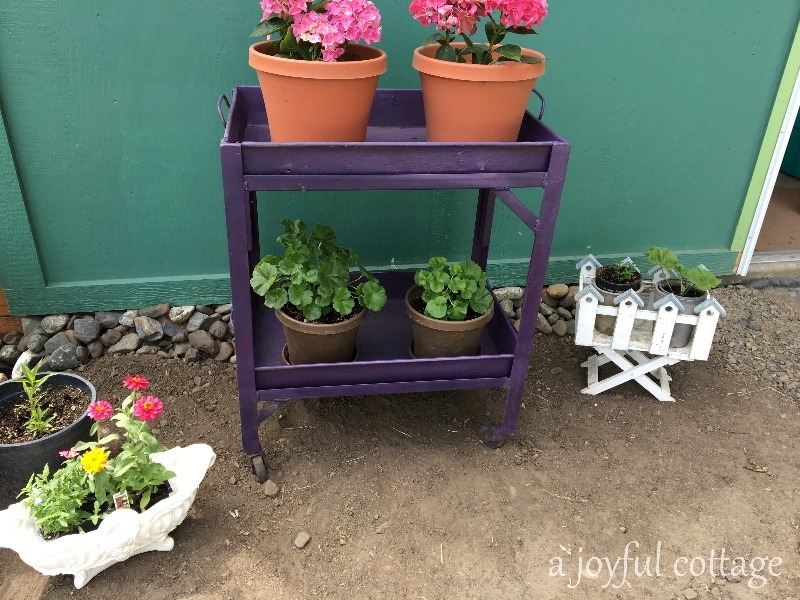 A cute mini movable garden. I'm not finished -- I need to pot the plants and I'd like to do something more creative with the bland plastic containers, but this is a big improvement and I'm pretty happy with what I've done so far. I planted my mini enclosed garden too. Flowers on the left, peppers on the right. I have room left for a cucumber and maybe something else. This is where I plant things that the deer like to eat. I have some ideas to give more charm to this space. This was -- and still is -- a fun project. And very, very inexpensive. Except for a few plants I purchased prior to the project, I already had everything I used. What I had came from thrift stores, yard sales, or was free. This is just the kind of project budget I like. Oh how cute and I love the purple. Made a huge difference in the shed. And Dennis's building looks great with the new siding. 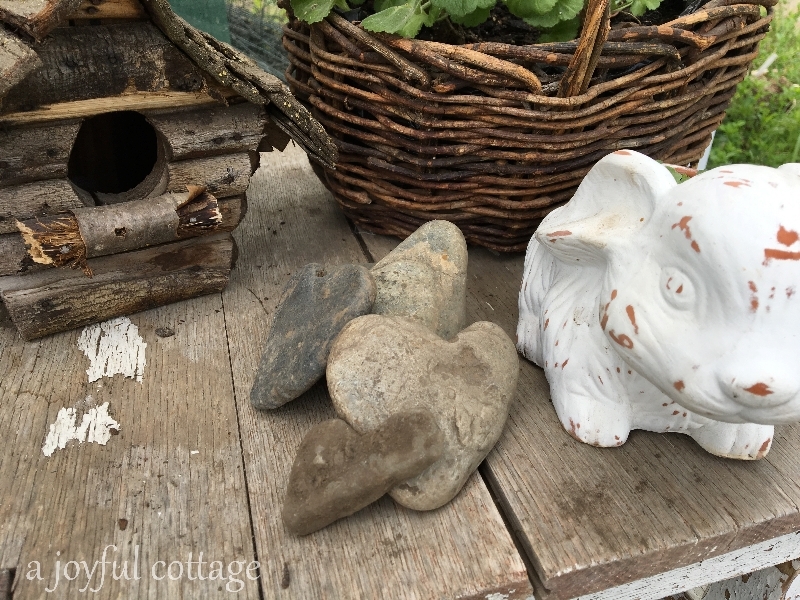 Great collection of heart rocks. Love how you pull everything together. Thanks. This is one gardening project that was just plain fun! The purple turned out perfectly . . . I liked it against the Garden House green . . . So were the rocks in amongst the soil . . .
Like the look of them placed near the garden house edge . . .
Oh Nancy, SPLENDID!!!!!!! I love your pop of color, I SO DO! 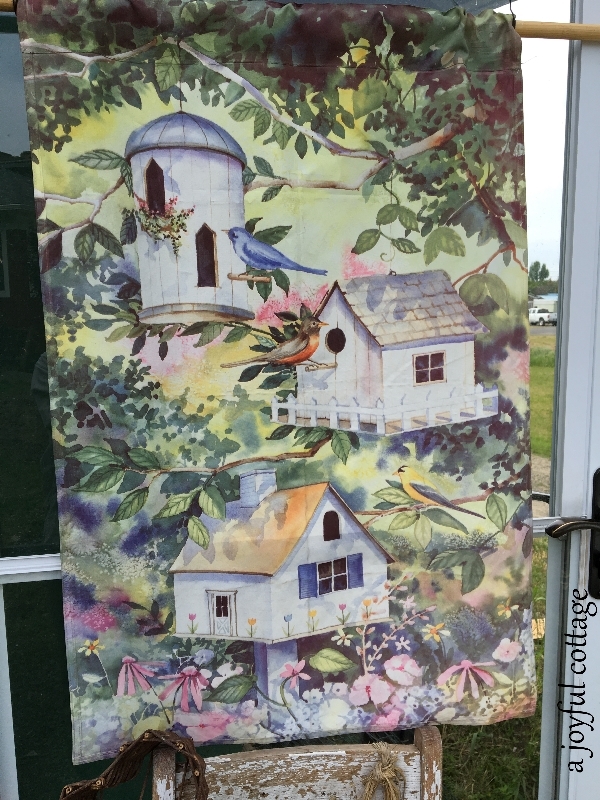 Lovely addition to the garden shed, and all the other lovelies you have added!!!!!!!! I love this time of year. So much fun to be had and it's only June 15th. YAHOOO! What a fabulous makeover Nancy - you've made it look really great. 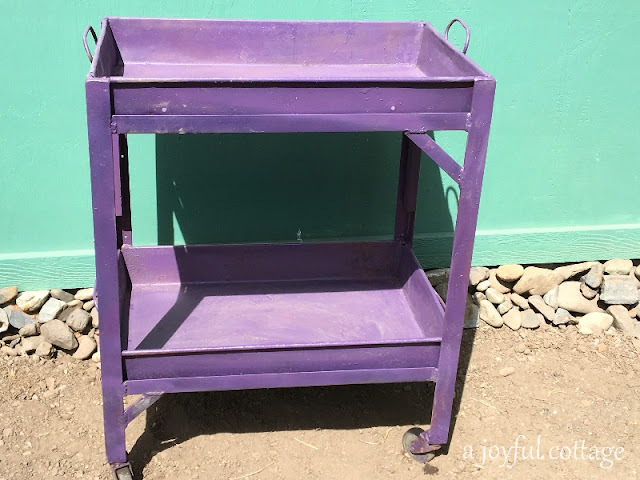 I love the 'new' purple cart - it will be a useful piece - and all the other odds and ends you've added are so pretty - especially that flag (I love outdoor flags and have a collection for different occasions). Digging through rocky soil is always so hard - lovely how you've actually made use of them though. Something I'd add, and you may want to consider, is climbing/vining plants which will clamber up the shed and eventually around the windows perhaps. I can see jasmine or roses - think of the fragrance! You could even plant them inside the deer proof enclosure if necessary. For the summer months you could also just grow morning glories and/or moonflowers along the fence (easy/cheap from seeds planted in a large pot), mine are coming along and will soon be adding color and evening perfume to the front porch. Dennis is doing a great job there - is he for hire, haha????? Sweet! I like your project and the studio project that Dennis is working on. I can tell you are enjoying yourself. 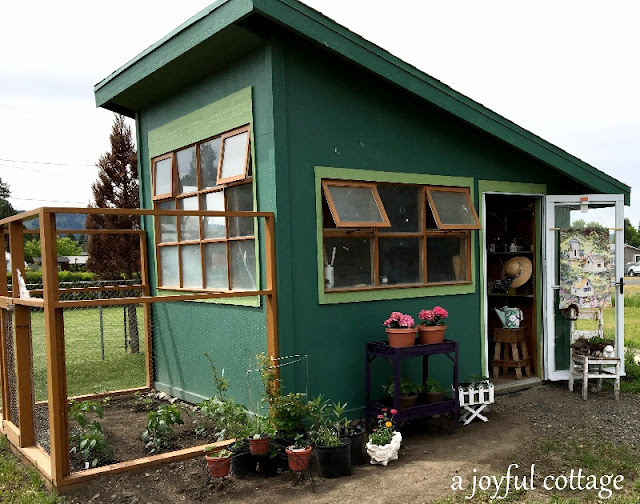 What an adorable shed and garden! Love the shake shingle siding, it is so pretty. 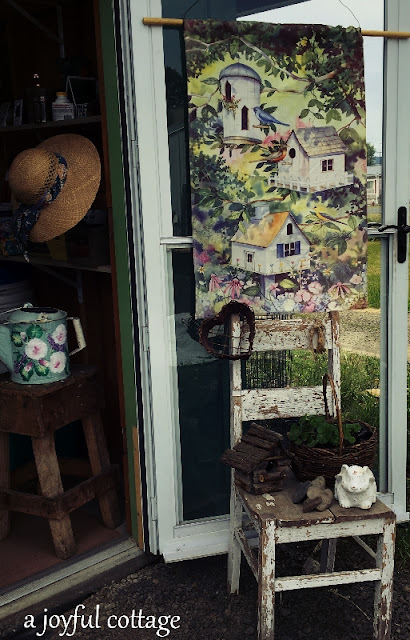 Your garden shed is lovely, too and the happy colors choices for it and your cart add that cottage whimsy that all cottage gardens need. At first I thought that you had added chickens to your list of country pleasures and then I remembered the amount of deer you have in your area. I imagine they can be a real problem in the garden. Do they ever attack your flower beds? Love love love!!! That shed is just adorable Nancy and I love the purple cart added with flowers. So cute. 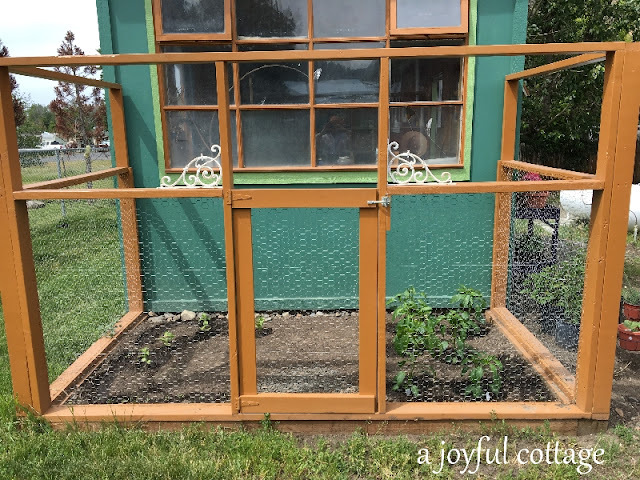 I love your enclosed mini garden but right away I thought ohhhhhhh that would make a great chicken coup. I could see you with a few pet Chicks in there and nice fresh eggs for you and Dennis for breakfast. Just sayin lol! I would love to have some chickens and fresh eggs. Hi Nancy, your garden shed is amazing and just the perfect size. I know that you will be enjoying it all summer. You have been working hard on this! I love the idea of the privacy fence around. It will also help keep out the deer. I'm not sure when we'll build the fence, but when we do I'll be doing a happy dance. I want to grow things deer love. . .like roses and hostas. Adorable!! I love country gardens like yours....and mine! Absolutely adorable, Nancy and I am a huge fan of color. Purple tops the list, right up there with green. In fact my first cottage, all 900 square feet of it, was decorated in yellow, purple and white. Hugs! 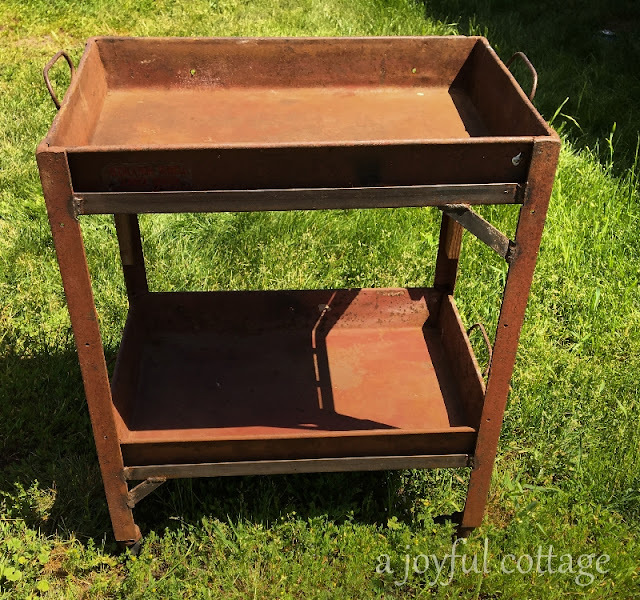 Oh, I was so sad to see all the rust go but you turned that cart into FABULOUS! I never would have thought to use purple and the unexpected color is what makes it so fun. It looks great up against the green. You turned bland to beautiful! 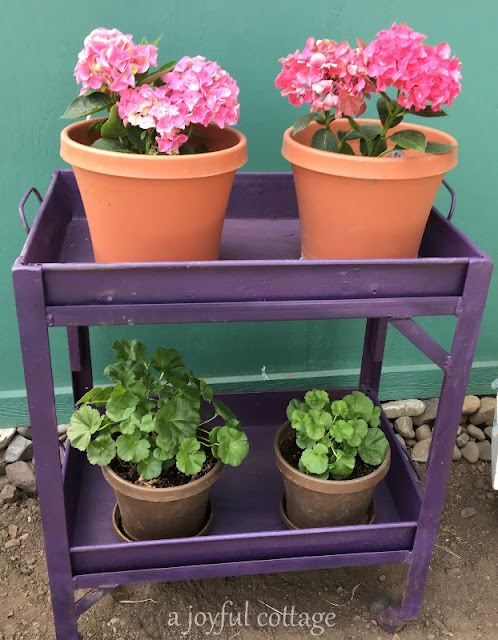 I love the unexpected color of the cart, it looks beautiful with the pots. I'm behind with my blog reading. I was away, got back, and am now rushing to get everything done before going on a proper summer vacation next week. But I made it! And just in time to check the progress of the shed. Your own proper small space. I do like your enclosed garden and have to show it to my husband. I want one like that to keep deer out of.. Wonderful color on the car. OH, my goodness!! It is truly a delight to look at! You did an amazing job!!! I LOVE what you've done with your garden space! What a big change. You always iinspire me, dear friend. So lovely, Nancy! Your garden shed is adorable (I'm envious of other peoples' pretty garden sheds... ours is old, rusty and ramshackle). At first, before you explained your deer deterrent fence I was thinking you were going to be keeping chickens! Oh what damage deer can do. I absolutely love, love, love this. Very cute. Love the Shake siding. The tie-together project sounds perfect but you have all the time in the world to put it together so don't rush it too much - although I can't wait to see. 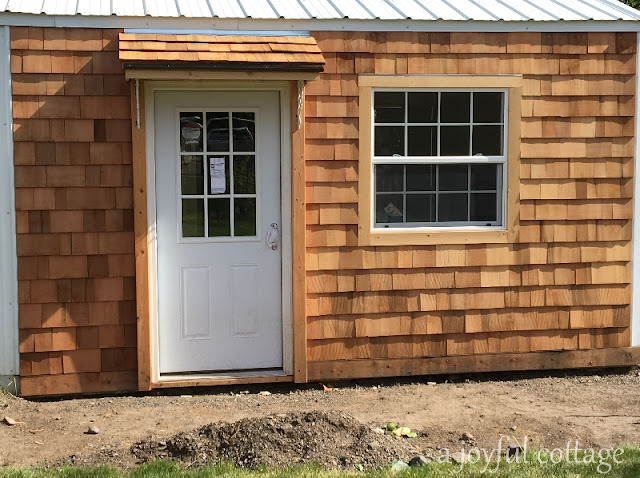 Dennis did an amazing job with the shingles and I love how you styled the cart and the front of your shed.